My husband, daughter, and I moved to Colorado a short time ago after living in Georgia our whole lives. I've been sending a lot of cards back home to Georgia, because I want my friends and family to know that I am always thinking about them. I came up with this card because it is easy to make and duplicate and because the sentiment is so true. Enjoy. Cut and emboss white panel. 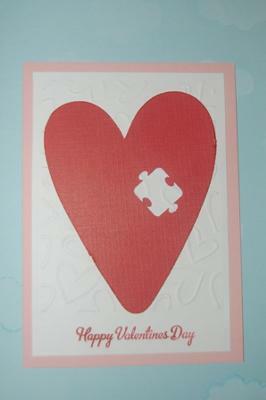 Stamp "Happy Valentine's Day" on bottom of white panel where embossing folder did not reach. 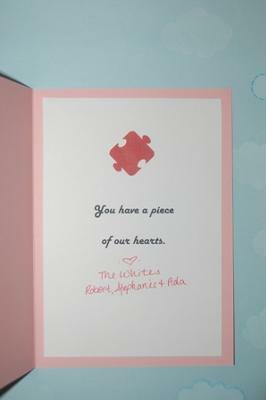 Adhere white panel to front of card. Adhere inside sentiment panel to card. Decorate the envelop with heart stamps/stickers. Mail to your family and friends to let them know you love them. To save paper, you could just make this a front and back Valentine! I am working on a blog that will be at stephysays.com. It's not up yet, but keep checking back!